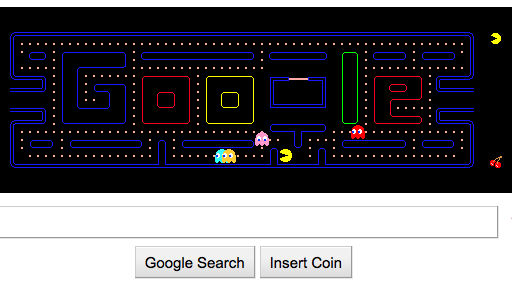 Today is the 30th anniversary of the video game Pac-Man, and so, the Google homepage has a special commemorative graphic. Only this one's even more special than most: it's a complete implementation of the Pac-Man game, in pure HTML5. Not only is there no Flash involved, but its assets consist of only one image, with the individual elements being drawn using CSS sprites. Alas, it'll probably be gone forever come the 22nd, so play with it while you can. Update: Google PacMan is permanently located here. According to a Harvard University report on video games, Pac-Man is "64% violent". Furthermore, a clear majority of games reward players for "injuring other characters"; one example of this is Mario Brothers, with the thing about jumping on turtles. Given that Pac-Man involves a flat yellow disc consuming white dots and chasing stylised, monochromatic "ghosts", I wonder how abstract one could make a game (or an animation) for it to remain violent. If one had a primitive video game featuring, for example, two coloured squares on a black background, with one obviously "attacking" the other which (exhibiting what the human brain instinctively perceives as fear) moves away increasingly frantically, would this qualify as a violent video game? This sounds like a challenge: how much violence, aggression, brutality and other antisocial and harmful behaviour could one depict in an entirely abstract fashion, without using recognisable real-world objects or cartoon approximations? The opposite of this would be something like a Brothers Quay animation, which includes things that look like real world objects, but whose parts move around in an entirely random and pointless fashion, not unlike a malfunctioning computer graphics program. In fact, Iwatani acknowledges that, while a eureka moment for the annals, that event represents the official birth of Pac-Man: "The whole thing actually started with me walking around games arcades watching how many boys were playing and the fact that all the machines were about killing aliens, tanks or people. Girls were simply not interested, and I suddenly had a motivation for my work: I wanted game centres to shed this rather dark, sinister image, and it seemed to me that the way to raise the atmosphere of a place is to entice girls to come in. The whole purpose of Pac-Man was to target women and couples, and get a different type of player involved." "So there I was, wondering what sort of things women would look for in a video game. I sat in cafés and listened to what they were talking about: mostly it was fashion and boyfriends. Neither of those was really the stuff of a good video game. Then they started talking about food -- about cakes and sweets and fruit -- and it hit me: that food and eating would be the thing to concentrate on to get the girls interested." It may have been aimed at girls, but boys converted to it immediately: Pac-Man's most interesting revelation was gamers' affinity to living things. And that spark of inspiration has taken the industry from a 2-D yellow disc through Mario, and on to a 3-D Lara Croft. Alpaca is a small multitasking operating system for Z-80 computers, specifically for Pac-Man/Pengo arcade hardware. It is an expansion upon my PTUI project, which was originally just an experiment to see how much of a real GUI can be put into the tight constraints of Pac-Man arcade machine hardware. The limitations are a total of 1kb of RAM (for storage and stack), 16k of ROM, sprite/tile based video hardware (1k color, 1k character ram), joystick, and two buttons. And here is an extensive page on coding for the Pac-Man/Pengo hardware, including technical info, links to tools and sample ROM sets (no games, but there's an audio sequencer or two there; I'm sure there are some avant-garde applications for one of those). It's interesting to look at the memory maps and other documents. In some ways the arcade machines were conceptually similar to 8-bit computers; in other ways, however, they're bizarre (for example, the Pac-Man machine's video RAM is all over the place).